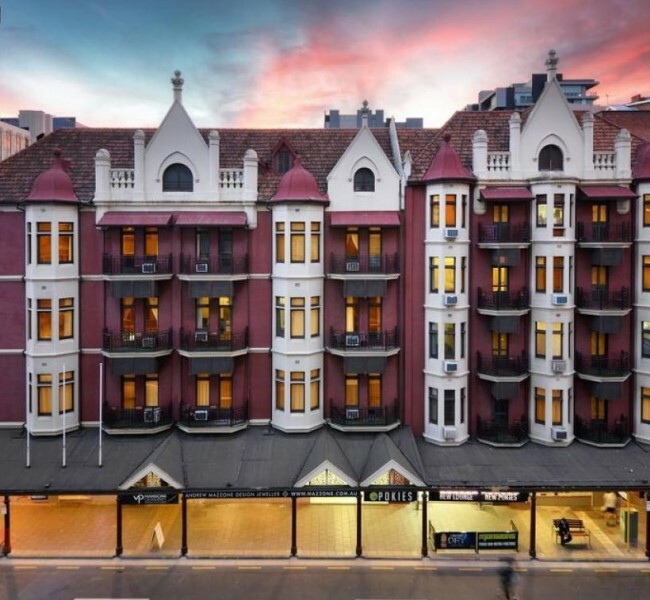 La Loft Apartments’ Mansions on Pulteney property, at 21 Pulteney Street in Adelaide, provides stylish hotel-quality living with more space, privacy and facilities than you’ll find in any nearby accommodation. 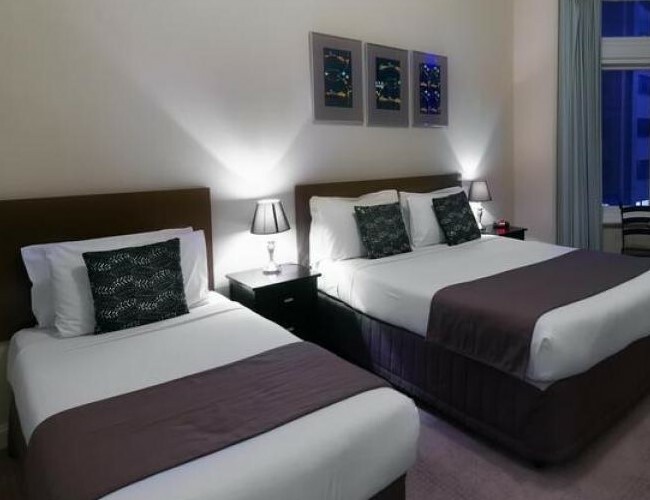 Perfectly positioned between Rundle Mall and North Terrace in the heart of the Adelaide central business district, this quality serviced accommodation will make your business stay or holiday enjoyable and comfortable. Fully furnished and self-contained, our studio and one-bedroom apartments at Mansions on Pulteney are presented with many of the original 1912 features of the heritage building such as high ceilings and spacious rooms. Ideal for overseas, interstate or out-of-town guests, or even locals looking for a base from which to explore their own city, you will delight in all the comforts of your own home – only better. Our Mansions on Pulteney apartments feature fully-equipped kitchens, reverse cycle air conditioning, wireless internet access with complimentary WiFi, LCD televisions, opening windows, and balconies. Car parking with a height restriction of 2.1 metres is available directly across the road for an additional cost, with 24-hour unlimited access. The accommodation at Mansions on Pulteney gives you unmatched access to Adelaide’s shopping, restaurant, cultural and university precincts. Nearby you will find the Universities of Adelaide and South Australia, and the best of Adelaide’s cultural, historic and entertainment venues. Only a short walk or a quick tram ride away are Rundle Street, Rymill Park, the National Wine Centre of Australia, the River Torrens and Elder Park, Festival Theatre, the Adelaide Zoo, Adelaide Oval, Skycity Casino, the Convention Centre, the Botanic Gardens, the Art Gallery of South Australia, the South Australian Museum, the State Library of South Australia, the National War Memorial and ANZAC Centenary Memorial Walk. You will be in close proximity to some of Adelaide’s best dining and bars, with a setting to suit everyone ranging from casual pubs to five-star cuisine. Our serviced apartments at Mansions on Pulteney are available for short-term bookings. Or, if you are looking for somewhere to call home for a longer term and take advantage of a cost-effective rate, the apartments provide superior executive accommodation and are a wonderful alternative to the commitment of a real estate lease. Our website and free reservations line can offer you the best fees, without any hidden costs and with the best terms. By booking directly with us, we can guarantee you the lowest advertised price. We promise our website will have the best publicly available rate at all times with no hidden booking fees. If you do find a cheaper advertised rate, we’ll honour that rate and give you an extra 10% off that rate. Contacting us directly also puts you in touch with the person who will be welcoming you when you arrive at Mansions on Pulteney to check in. Our team member will be happy to assist you with any questions about the accommodation, surrounding attractions, and places to visit in Adelaide and South Australia. We look forward to welcoming you to your home away from home at the Mansions on Pulteney La Loft Apartments, where history and modern facilities meet. Book directly via our website or give us a call!